I am a french Computer Science student at Polytech Nantes, the graduate school of engineering of the University of Nantes, in France. Currently in my 4th year of studies, I have a strong passion for web development, data and AI. This summer I have the opportunity to do a 3-month internship abroad. Therefore I am currently researching companies which might be looking for innovative interns so as to apply. This entails filling applications forms, writing emails and cover letters. But how to stay organized? 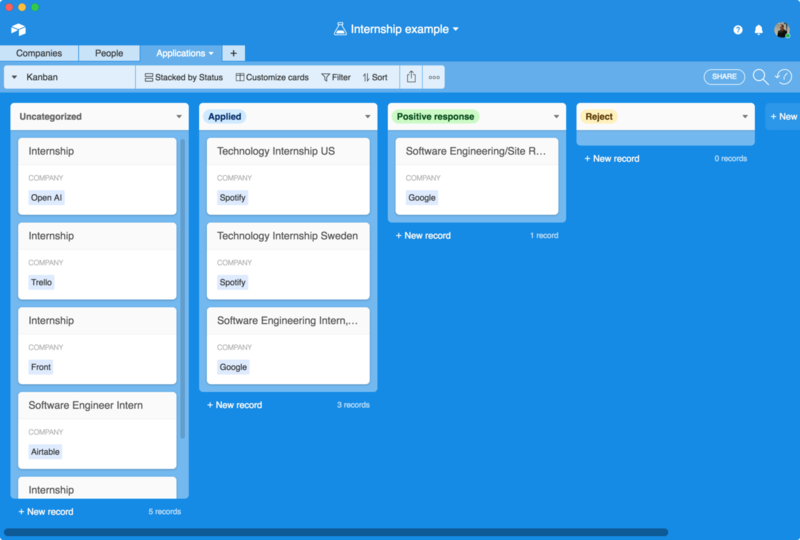 This last few weeks I have been using Trello but I was considering using a spreadsheet instead to keep track of applications I have been sending and companies I am in touch with. 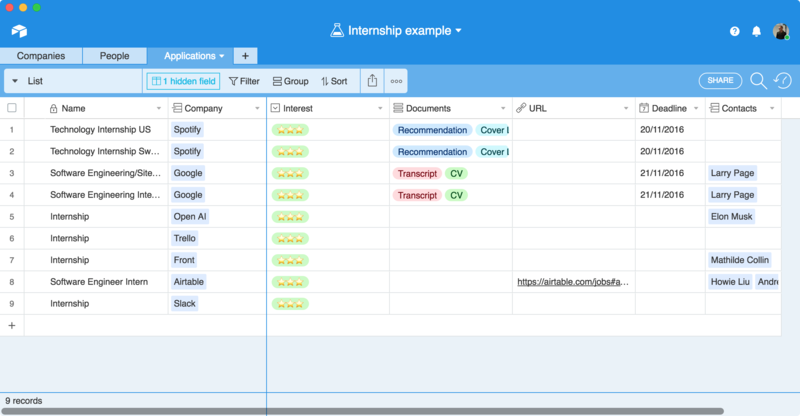 And some days ago, wandering on Product Hunt, I discovered the truly amazing Airtable. I decided to give it a try and build my “Internships research” database with it. 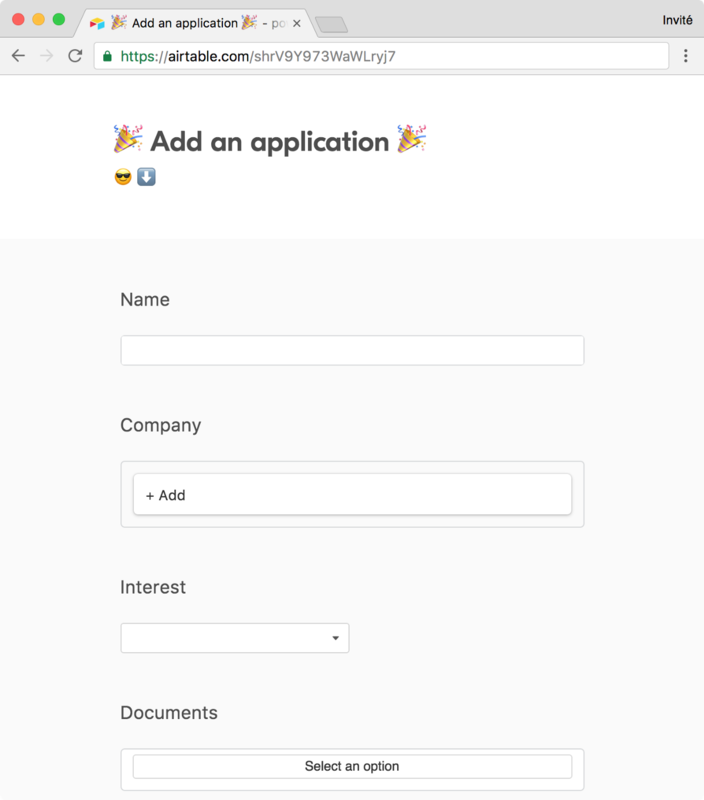 So what is Airtable? No-one can explain the service better than a team of young film makers 📹. Additional features are presented on the Airtable website too. 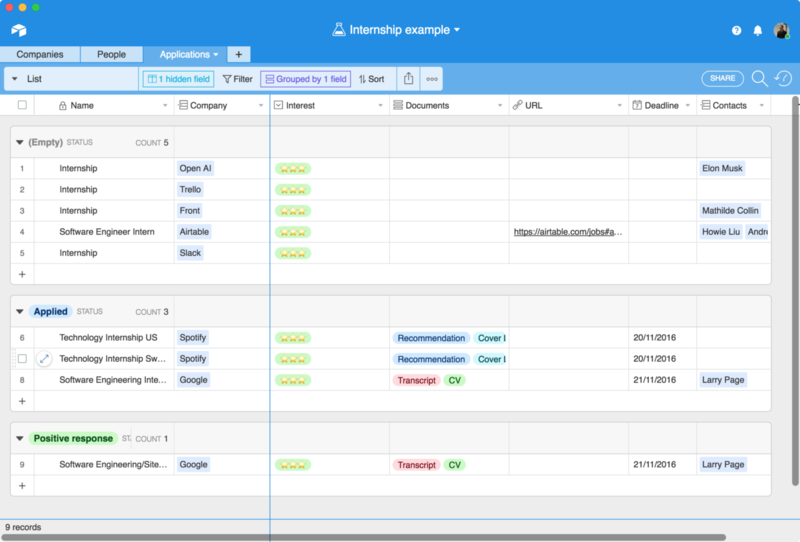 To keep it short, Airtable is a mix between a spreadsheet and a database, with a very clean UI. 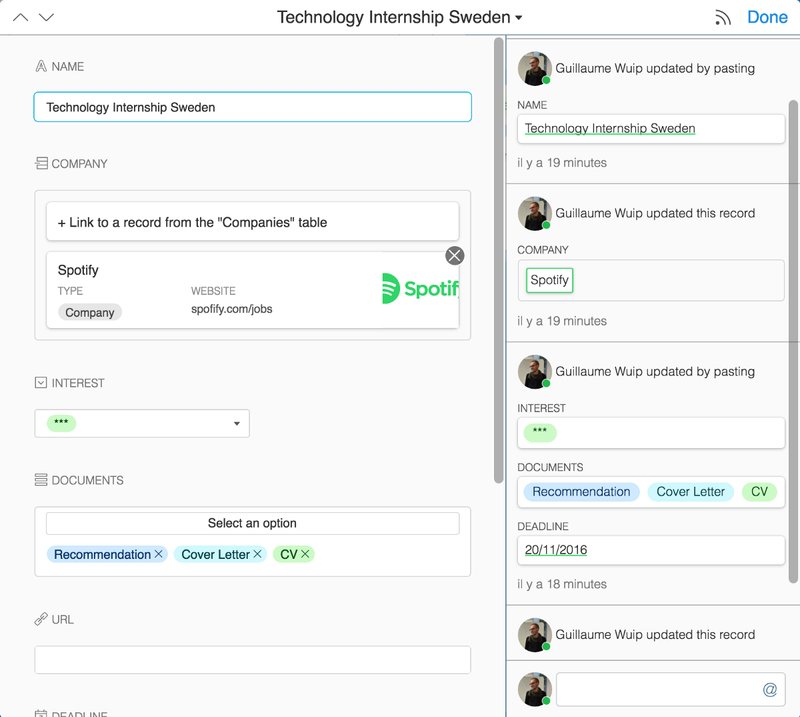 Ok, so now, let’s imagine you are a very talented Computer Science student looking for a fabulous internship with Google, Spotify, OpenAI or of course Airtable. You want to keep track of your research progress. It could also be convenient to keep track of people we speak to, whether they are contacts from the above mentioned companies or others. We will just add another table called “People”. You may have noticed that, when adding the Company column, a People column appeared in the Company table because of the bidirectional relation between the two. It’s time to list some applications. 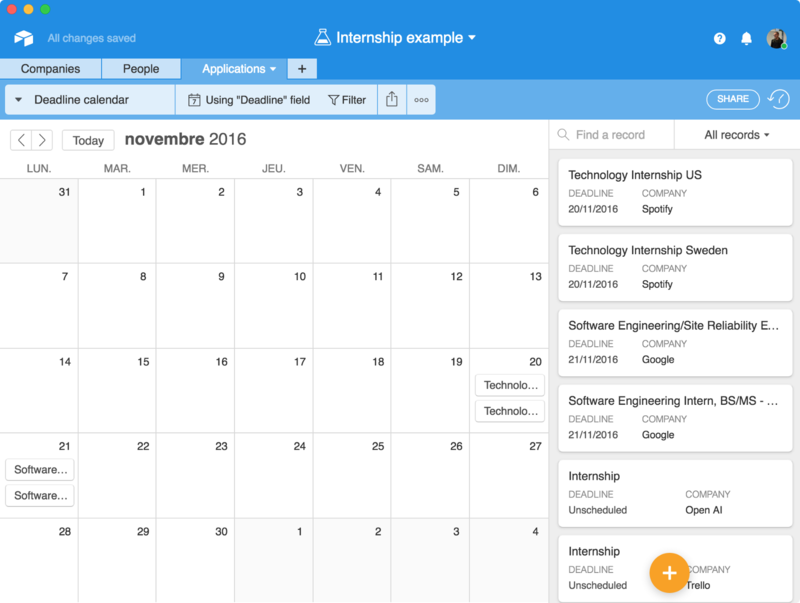 Taking into account that there could be multiple internship offers from one company, it is better to create a new table “Applications”. Actually we are applying relational database relationship here (Many to One), but with a nice UX. A few applications. Of course all are ⭐⭐⭐ ! Not bad ! We can easily add applications and link them to the companies and the people that could help us. Wouldn’t it be better if we could split the table between already-submitted applications and the rest? 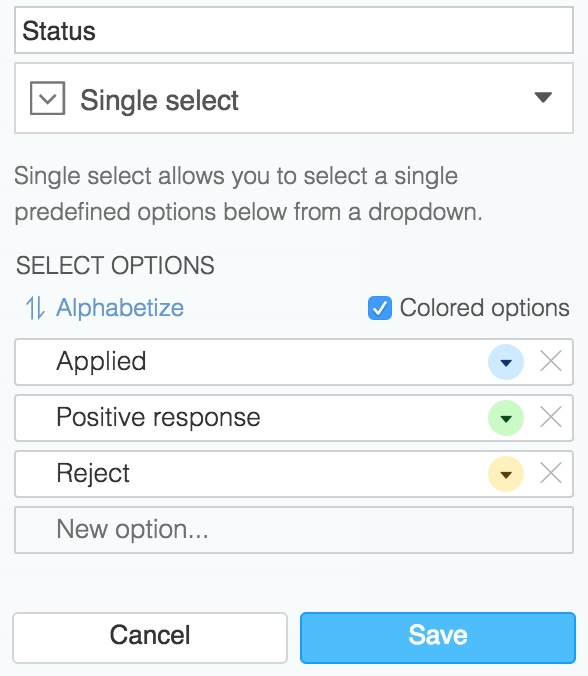 It can’t be easier than this : just add a Single select field or a checkbox Status and use it to group your data. Use a Single select to group applications by status. Given this classification, let’s look for a new way to view our data. Here, the Kaban view could really help us see where we are in the process. When you click on a card/row, you always open a popup with all the data of the concerning application and history of changes. You can even leave a comment, let’s say, for a friend helping you. Speaking of views, let’s try to add a form. It could save us some time adding a new application. Instead of adding new rows, simply keep the form open in a tab of your browser. There is also other useful views like Calendar and Gallery. 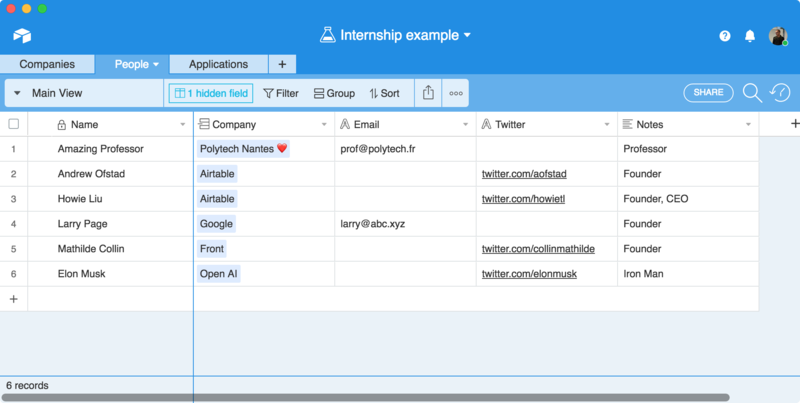 Airtable has also very powerful field types like Lookup, Count, Formula or Rollup. Let’s go back to the Companies table to play with some of them. First, add a Count column, counting the number of applications by company. 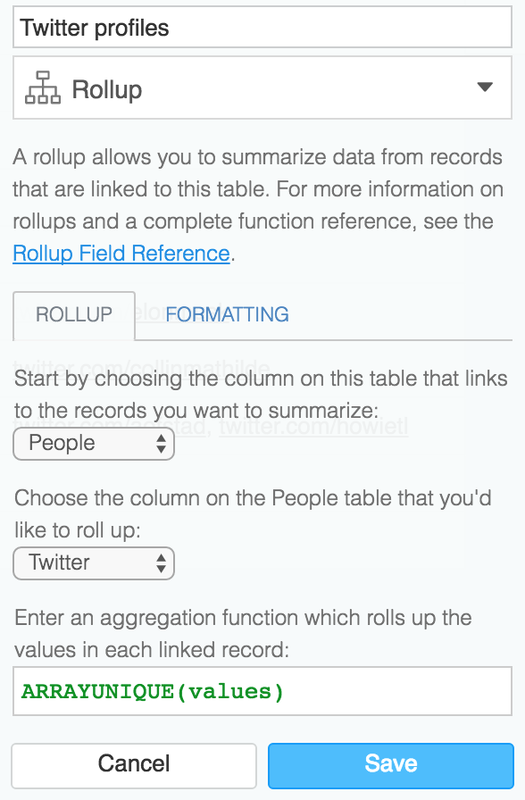 New Count and Rollup columns. Nice! Pretty neat isn’t it? Here’s the full base. 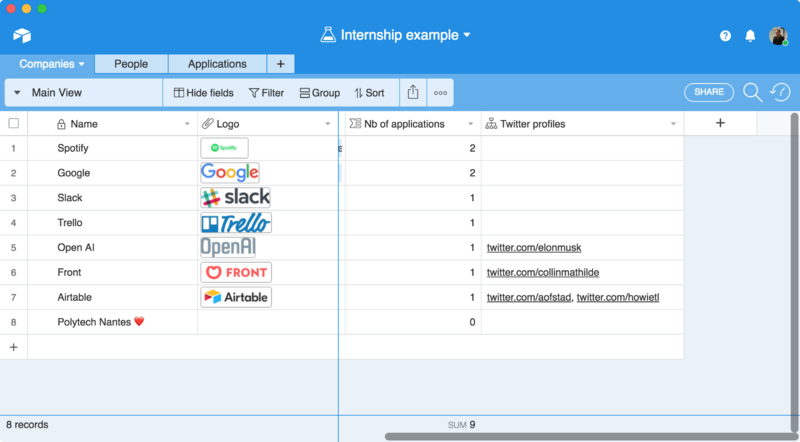 Just copy it on your Airtable account to start managing your internship search too! There is still a lot of features to explore. Their iOS and macOS apps are great. All is web based and should be working well just about everywhere (I have read somewhere they use React under the hood ❤). Whether you are on your desktop or mobile, you can always add and edit your documents. But if you want a full spreadsheet view, you’d better use the desktop version. There is also a full REST API which is a very interesting feature. 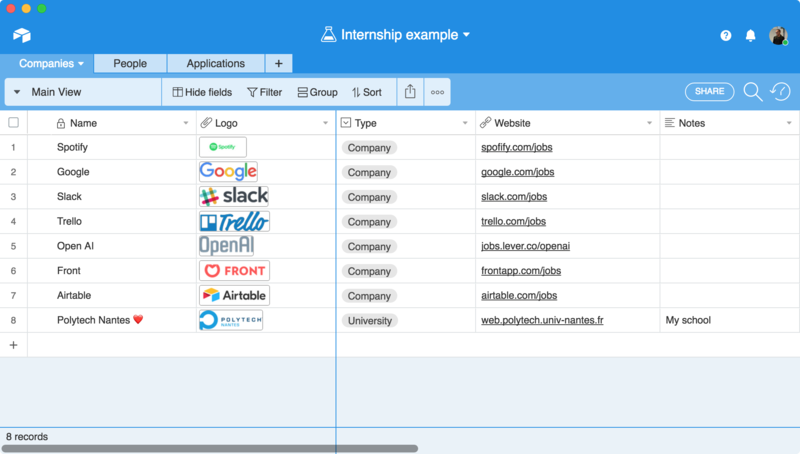 You can actually use Airtable as a full relational database in the cloud. They even have a NodeJS client. I am definitely going to build something with it. I am a French Computer Science student at Polytech Nantes, the graduate school of engineering of the University of Nantes, in France. Currently in my 4th year of studies, I have a strong passion for web development, data and more recently AI. This summer I have the opportunity to do an 3-month internship abroad, so if you are looking for a creative and forward-thinking developer intern, do contact me.